Easther Chigumira has recently published an excellent paper in The Journal of Rural Studies, Political ecology of agrarian transformation: The nexus of mining and agriculture in Sanyati District, Zimbabwe. It’s well worth a read if you can get past the pay-wall. Here is a quick overview of some of the highlights. The paper aims “to examine the process and expression of re-peasantization in Zimbabwe through a 10-year on-the-ground study into the lived experiences of land recipients from three resettled communities in Sanyati District (formerly Kadoma District)”. Based on intensive, engaged field research, the paper is full of fascinating insights, particularly around the links between agriculture and mining. This wider scope of analysis is important and revealing. While it’s true many of us have focused on production, and the associated class dynamics, a wider appreciation of what people are doing and why is important, especially in order to get a sense of the diverse livelihoods – including artisanal small-scale mining (ASM) – that people are pursuing and how these change over time. In this paper, insights are enhanced by the longitudinal nature of the study, with surveys in 2004/05 (soon after settlement), 2009 (after several years of extreme economic crisis) and 2012/13 (in a relatively stable period). The study encompassed two A1 settlement sites (a villagised and self-contained) and one A2 site. The paper offers a number of significant conclusions, highly relevant to on-going debates about Zimbabwe’s new agrarian landscape. Settlers come from diverse origins, around half originally from urban areas, the other half from rural areas. While initially land invasions did not appear to be directly linked to party affiliation, access to land in later years, particularly around the 2008 elections, linkages with ZANU-PF became more important, particularly for young people requiring land. An emergent patronage system evolved, requiring people to at least ‘perform’ being party members. This was most prominent in the A1 villagised area, reflecting the particular patterns of land allocation and local politics, as young people demanding land were slotted in around election time. But patronage was not the whole story, and the empirical data suggests a more nuanced story than others have offered for other sites. As observed in many studies, processes of differentiation are on-going, as some accumulate and others struggle. A distinct grouping of ‘rich’, ‘middle’ and ‘poor’ farmers is observed in the area, with distinctions becoming greater over time. Crop outputs are highly unequal, for example, with higher outputs overall from A1 farmers, as the medium-scale A2 farms suffered serious capital constraints. Production varied over time due in part to rainfall, but also to the economic situation, affecting availability of inputs, with a big dip in 2007-08 at the peak of the crisis. Many settlers have diversified livelihoods (‘pluriactivity’), and this has grown over time. Small-scale mining in particular has become important, as a complement to agricultural production. This was especially so when the economic crisis deepened and the gold price increased. The paper argues that “the commonly held view that non-agricultural activities such as ASM are an indicator of de-peasantization/de-agrarianization is flawed…. Instead, the study “provides evidence that context specific realities need to be considered, because ASM can also be an integral part of re-peasantization”. Mining in the area is a year-round activity, with important gender divisions of labour. Men engage year-round, while women are more seasonal miners, focusing on agriculture in the cropping season. In some cases, settlers employ others to help, generating a new labour economy in the area. A range of off-farm labouring jobs are pursued. The extent of these have grown too. They include: In 2004/05, most ‘maricho’ (piecework) activities were carried out by women alongside former farm workers, but increasingly men are involved too, as a local labour market grows, responding to demands from more successful agricultural producers in the area. The later settlers (post 2008) in particular were especially reliant on this source of labour based income. Investment has also occurred beyond the farm, and this accelerated particularly post dollarization. Relatively well-off farmers now have small shops and other businesses in the area providing services, removing the need for settlers to travel to Kadoma to purchase items. Finally, the state has been largely absent in the area throughout the study period. But whereas in 2004-05 people complained, by 2013 most had accepted this, and created new ways of gaining services, sourcing finance and so on. There was noted growth in entrepreneurial activity among individuals, as well as collective action in groups, around issues ranging from credit to marketing to input supply. The patterns seen in Sanyati are very similar to what has been observed elsewhere. The integration of the mining economy is perhaps more evident than in other areas, although work in Ngezi, Matabeleland and elsewhere observes this as an important phenomenon. Land reform was not just about opportunities for agriculture, but access to other resources too. What is striking about the longitudinal story so effectively told in this paper is how things have changed – greater class differentiation, shifting gender roles, more asset accumulation, shifts in work/labour patterns and so on, while particular events generate important shifts, driven by the wider political economy, with 2008 being an important conjuncture. Making sense of the implications of land reform in Zimbabwe requires just this sort of study, and this adds to others offering nuanced insights that help new framings for policy. This is the second in a series of short reviews of new work on agriculture and land in Zimbabwe. Nearly all of these studies are by Zimbabwean researchers, reflecting the growing research capacity and ability to comment on important issues of policy in the post-Mugabe era. If there are other papers or books that you think should be included, please let me know! Maphisa in Matobo district in Matabeleland has transformed from its early days as a TILCOR (Tribal Trust Land Development Corporation) growth point linked to the nearby Antelope farm estate. Like Mvurwi and Chatsworth that I profiled in the earlier series on small towns and economic development, Maphisa is booming in the post land reform era. “Maphisa was a forest. It was a grazing area for communal livestock. The place where Omadu Motel was located, was an aerodrome for the white farmers and those on the estate. In the 1970s, a white man called Fish was sent to address the local community about justification for building Maphisa township. He explained that Antelope dam and irrigation were going to create jobs and benefit communities who would in turn invest at the township and grow rich. The chiefs and local leadership present at the meeting agreed and Maphisa was established”. “In 1973 I cut down trees and built my shop. It started operating in July 1975, as the authorities made it difficult for a black person to possess a liquor licence. In 1975 TILCOR drew a masterplan for Maphisa, started clearing land and built three shops and rented these out. Four other private shops including mine were operated by teachers”. Post-independence these early growth points were incorporated into the wider spatial planning approach for mixed development. The TILCOR estate was taken over by ARDA, and for several decades Maphisa became intimately linked to the success of the nearby estate. ARDA created opportunities for outgrowers on 150 ha of the irrigation scheme, with plots averaging 1-2 hectares. ARDA also began to build infrastructure in Maphisa in the mid-1980s , including housing for workers and some general dealer shops. The government also established administrative offices for various government departments at the time, and built the Hlalanikuhle location with high density housing. The ARDA irrigation scheme was central to the economy of the town, as it employed up to 8000 people at the height of the 1990s cotton boom. But through this period Maphisa remained an enclave, reliant on the ARDA estate, and surrounding by large-scale commercial farms, owned by whites (although with one black-owned farm belonging to Chief Ndiweni). These were huge ranches, supplying beef to CSC abbatoir in Bulawayo, and many with commercial gold mines on them. The impact of this largely white-owned farming-mining economy on Maphisa was limited. This all changed with land reform, with most farms taken over, and allocated to resettlement land. In this period too the fortunes of ARDA declined, with many laid off, and the estate production collapsing. The outgrowers (now numbering 132 families) have carried on making use of canal irrigation, but got little support from the estate. With new people on the land, Maphisa changed from an estate-linked enclave town to one serving the wider area, with a whole range of new businesses established. The decline of ARDA though had a negative effect, as revenues from labourers working on the estate vanished. In 2015 a new investment partnership was agreed, with Trek Petroleum, a local company, taking over the estate operations, and investing substantially in 12 new mobile centre pivot irrigation systems and 350 HP tractors, growing maize over 520 ha (including seed maize contracts with various companies). As I will discuss next week, this highly mechanized operation has not created the level of employment of before, but it has nevertheless meant that new life has been injected into the economy. Our enterprise survey in Maphisa showed that the local economy has grown since 2000, despite challenges. There are now 6 supermarkets (when before 2000 there were none), 8 butcheries (from 4), 5 hardware stores (from 1), 10 bottle stories, some including ‘nightclubs’ (from 6), and more than 30 kombi operators. Plus today there are more welding shops, tailors, hair salons, service stations, car washes, internet cafes, photocopy/typing shops, and ecocash outlets. There are now more people living in the town, and investing in property. The occupied high density stands have increased from 223 to 1118, while the medium density stands have increased from 121 to 498. Low density stands have not had such a take-up but overall the size of the town has increased significantly, and with this business activity. “Land reform opened up more grazing land and opportunities for livestock marketing. I have 80 cattle, mostly Simenthal crosses. I hire private transporters who charge USD 40 per animal to Bulawayo, where I get around USD 800 per beast. I have just too many goats at the farm! Prices are good. I can get USD 50 per goat. The new cattle business is helping Maphisa to grow. For example, hides and skins are available for establishing a tannery industry. Also, there are plenty of mopane worms. Value addition and packaging could be done here”. “The supermarket business is good – we are the leaders here at Maphisa. I employ 34 people. Yes liquidity is a challenge that forces prices down. ZESA high tariffs are a concern too but plans are on to change over to solar power. We sell products to civil servants, ARDA employees, irrigation outgrowers, miners, communal and resettlement farmers and in transit customers. Up to 200 customers cross our doors per day”. “Proceeds from working in South Africa, the UK and the US helped me to build the business premises over a 5 year period. Some of the money was also raised from horticulture at the family’s 6 acre plot near Bulawayo city. I also did buying and selling cattle as an additional sideline to raise funds. We employ 4 workers in the restaurant and 2 in the bottle store. Business is up and down at the restaurants. We managed to keep ZESA bills down in the restaurant by using gas and firewood for cooking. Electricity is only for lighting and fridges. Beer sales go up when ARDA pays its workers but it is the miners contribute a lot towards beer sales”. “From 2009 I have been renting this shop where I operate a butchery and food outlet. I pay USD 350 per month rent. I buy cattle for USD 400 – USD 500 on the hoof after bargaining with the seller. I take the beasts to Maphisa Council slaughter facilities. I buy 2 – 3 beasts per week and sell meat to customers at USD 5 per kg. I prefer buying live cattle because after slaughter I gain from offal, heads and hooves. I used to sell hides to several buyers, who have since gone bust. The food outlet business is a strategy to increase turn-over of meat sales from the butchery. My wife supervises the business while I run around looking for slaughter stock. I also have a A1 villagised land reform farm, with 30 cattle. These support my business”. “I operate the shop on my own. We recently added an agro-vet section to the hardware. 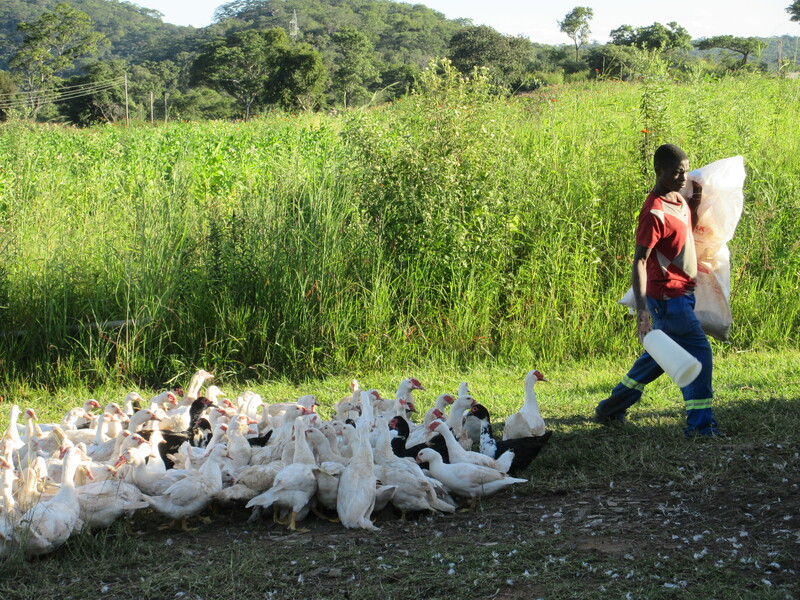 Our customers are local but we also sell hardware and livestock medicines to resettled farmers. To promote sales, we extend credit to those we know – based on trust. I used proceeds from the hardware to educate my children and to build my house. I also built another house at my parents’ home nearby”. 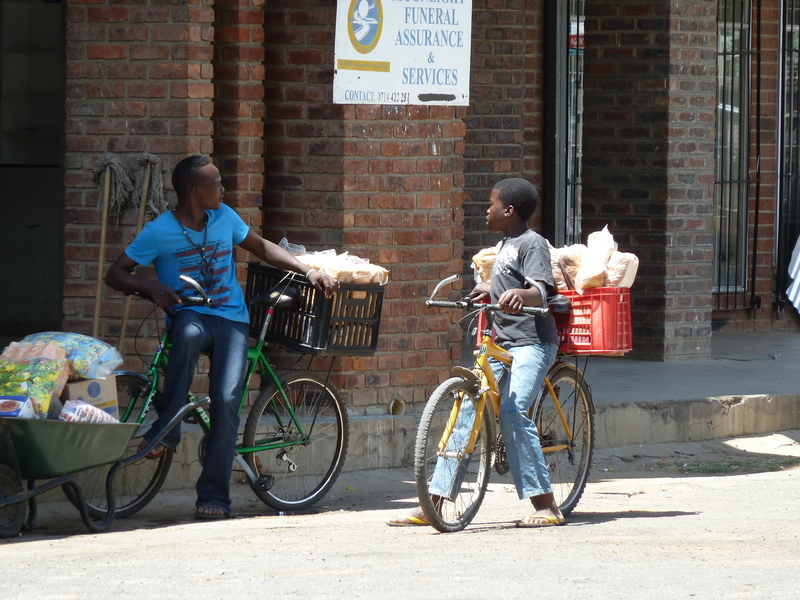 The growth of informal trading in Maphisa has been huge. The council rents out numerous stalls. Mrs N is a trader, and has been operating since 1986. Originally there were only 9 stalls, but now there are about 20. The traders sell vegetables. These were originally supplied by the ARDA estate, but now local farmers in the resettlements supply them. “We use cellphones to communicate and they bring the produce here. I also order at the Bulawayo market. When business is booming I go for orders three times per week. I pay USD 10 bus fare to and fro, or get Kombis to go and bring our orders. Proceeds from the market have been critical in keeping the home going – purchasing food and groceries, paying school fees and council rates”. In addition to changes in the agricultural economy, it is also changes in the mining economy that have affected Maphisa in recent years. Before, mining was formal and relatively large-scale, with compounds built in farms, with little contact with the wider area. In the past the Falcon Gold company used to run many of the mines nearby. Today this has changed dramatically, with many new mining operations in the area, established. Mr T, a bar owner commented: “There are now well over 100 black miners with licences here. Night life at the GP is alive due to gold miners”. Each small mine operation employs around 30 people in each mine, meaning there are substantial numbers working in the area, and purchasing goods and services in Maphisa. Mining is not for everyone though. Mr S observes: “I would not like to go into mining – it is too much a game of chance. I know a guy who got 7kg of gold after mining for 6 months and he quit with his loot. Another guy has been mining for the last 6 years investing monies but reaping nothing substantial”. From an enclave town, linked to an estate, created through colonial racial-based planning, Maphisa has transformed into a business hub linked to local economic activity in both agriculture and mining. The estate remains important, and especially since the injection of new investment from through the partnership with Trek Petroleum (see next week’s blog). But it has a more diversified base today, and like other small towns shows the opportunities, but also challenges, of small towns in a restructured economy. There was much discussion about small-scale and artisanal mining at the STEPS Centre’s Resource Politics conference last month. This is where resources and politics come together; perhaps especially so in Zimbabwe. Ever since the enactment of Zimbabwe’s Mines and Minerals Act, which gives the state rights over mineral resources wherever they are found, mining has been controversial. In the colonial period, the Act gave precedence to miners over other colonists making use of the land, including for farming, forestry and ranching. The colonists of Rhodesia failed to find a second Rand, but the mineral resources of Zimbabwe are nevertheless rich. And with recent discoveries – notably diamonds in Marange and platinum in various parts of the country – mining has been the source of hot politics and big bucks. But beyond the international debates about ‘blood diamonds’, certification and scandals and speculation about corrupt deals between politicians, Chinese corporations and other mining firms, there is another set of contests over access to and control over resources going on. This is focused on small-scale or artisanal mining – sometimes through concessions (or at least leases within concessions), sometimes completely informal, as in much of the alluvial gold panning. Since the early 1990s, in large part as a response to drought and impending hunger, many people, especially in the drier parts of the country, have taken to mining/mineral extraction as a source of livelihoods. Estimates vary, but several million people are regularly making at least part of their livelihood from mining. This is often a precarious, dangerous and risky endeavour, as Clifford Mabhena and others describe. Dealers in gold (this is the dominant mineral extracted in this way) often operate monopolies or cartels and panners and miners may not get the best deal. International gold prices have been on the decline recently, so returns are low. The police and corrupt officials are always on the look-out for making a cut, so mining is embroiled in a mesh of patronage relations. It is incredibly hard work, and dangerous, especially when mercury is used in the process. Although the data is limited, recent work shows that over 70% of small-scale miners have some level of mercury poisoning. In the 1990s, Zimbabwe was at the forefront of supporting small-scale mining as a livelihood option. This was a response to the growth of illegal alluvial panning, with the idea that upgrading and formalising would create more viable and long-term sources of employment and livelihood. Various projects, including from the likes of ITDG/Practical Action and SNV, supported the development of small-scale operations. The investment in appropriate technology and business skills resulted in some significant successes. At the same time the government decentralised control over mining regulation and revenue collection to Rural District Councils. Although there were problems, it meant that councils were able to target local entrepreneurs, and support them. All this changed in the mid-2000s. At the height of the economic crisis, the Reserve Bank, under Gideon Gono, decided to recentralise control over mining. The rationale was the ‘rampant’ environmental destruction caused as many more took to gold panning and illegal, informal small-scale mining to make ends meet. The Bank was also in desperate need of revenues, and tax collection and other fees were not being collected due to the collapse of the state machinery, and there was a massive leakage of potential government revenue, justifying, they argued, a more centralised approach. At face value, the response followed in the footsteps of many other global initiatives trying to ‘formalise’ a sector, and reduce its environmental damage. The result was Operation Chikorokoza Chapera (no more illegal mining) starting at the end of 2006. This had many echoes of Operation Murambatsvina, applied to informal housing and markets, with a technocratic, modernist legitimation being applied to an essentially political act. For Operation Murambatsvina, it was related in part to regaining control over urban areas by ZANU-PF, while for Operation Chikorokoza Chapera it was more about capturing revenue streams at the centre, and redirecting patronage around mining. The result was disastrous for small-scale mining and people’s livelihoods, as explained in a series of papers by Sam Spiegel, based on work in Kadoma, Insiza and Umzingwani. The crack-down involved the full might of the state-military-security complex. Thousands were arrested (some 25,000 between 2006 and 2009, with 6000 still in prison in 2013), others were beaten, and people’s property was destroyed and confiscated. And what came in its place? The formal, regulated mining operations that were allowed under the new regulations were run by a combination of elite business people, always with good political connections, sanctioned groups (such as the well-connected Zimbabwe Women in Mining), and outsider investors with good political links, including a range of Chinese companies. Operating at this scale requires capital and investment, and to get past the environmental regulations which were insisted on is pricey, with most EIAs tagged at over $4000. This excluded most informal sector miners, except as part of groups or mediated by ‘sponsors’, well-connected mining barons. Because of the provisions of the Mining Act, mineral concessions supersede any other land use. While most large concessions are held by large mining conglomerates in established fields, the Ministry of Mines, under Obert Mpofu, has been handing out concessions in a large numbers of areas to new operators. While notionally controlled by environmental and other regulations, the central political backing of new mining operators is such that they often gain precedence – including over (relatively) newly allocated land reform farms. We visited an A2 farm on the outskirts of Gwanda that was completely devastated by surface mining. A concession had been granted to a well-connected group, and the farmer, despite being an A2 land holder and well connected himself at the local level, was at a loss. The cattle herd that he had built up on the farm over the past years since acquisition were grazing on a small portion, and mostly along the road. His farm had become worthless. The consequence of the crackdown and the shift of focus to a ‘formal’ sector, ‘modern’, ‘regulated’ approach to mining was that informal mining went further underground, became more corrupt (more people to pay off) and became a more vulnerable source of livelihoods given its illegality. But informal mining has certainly not gone away. The bans and crackdowns cannot prevent livelihoods – as in the past under the draconian laws of the Natural Resource Board that implemented environmental legislation as a form of disciplining with ‘scientific’ rationale. The capacity to regulate and control is inevitably limited, so people find a way around. Technology has helped, with metal detecting equipment – notably the ubiquitous ‘Vuvuzela’ that arrived in the country around the time of the South Africa hosted World Cup – having made things cheaper and faster if you can get hold of the equipment (which is now cheap and easy). And the ‘makorokoza’ (informal miners) are increasingly organised and vocal, often reflecting young people’s dismay at the stance of the state, and associated elites, with threats to invade mines and challenge the mining barons and the patronage based economy. In our study sites, particularly in the drier south of Masvingo and Matebeland South – small-scale mining and illegal panning is widespread and essential for livelihoods. Recourse to modernist and environmental rhetoric to justify elite grabbing of resources is a well-known move in Zimbabwe as elsewhere, but if the state was genuinely interested in inclusive development and environmental protection, it should return to some of the lessons learned in the 1990s, and develop a more integrated, decentralised and broad-based mining policy. And this has to come with a long overdue revision of the Mines and Minerals Act. With its colonial origins, it should no longer have such a purpose and a more balanced and equivalent perspective on land and resource use needs to be enshrined in law. All this will benefit people, the environment – and the exchequer. Unfortunately the current political economy of mining means this is unfortunately rather unlikely. As mentioned last week, the University of Sussex hosted the major biennial UK African Studies Association conference. Around 600 delegates were registered, and there was a real buzz, with panels on every conceivable topic from every corner of the continent. Quite a few papers reported on new work from Zimbabwe, and land and politics was a recurrent theme. In the end we had a single panel of three papers (as several panellists had to drop out at the last minute). It was a fascinating session to a standing-room-only audience. The three panellists all reported on new research in the now not-so-new resettlements, representing different geographic areas, and diverse methodologies. All looked at how new livelihoods are being carved out following land reform in A1 sites. This included in-depth reflections on the relationships between farmers and farmworkers, a quantitative assessment of production outcomes across sites compared to communal and old resettlement areas, and an analysis of how farm and off-farm livelihood opportunities are combined in a mining area. The session kicked off with an excellent paper by Leila Sinclair-Bright who discussed the changing social relations between ‘new farmers’ on an A1 resettlement area in Mazowe and farmworkers. Through a deep, focused ethnographic approach she looked at changing notions of ‘belonging’, and the way livelihoods are negotiated. A case of a chief’s court dispute over land highlighted many of the dynamics. For, while the farmworkers were accepted as part of the farm community, and even incorporated into the cultural fabric of life through their as ‘sahwira’ at burials, when a group tried to claim formally the land that they had been cultivating this was rejected by the A1 farmers. ‘Belonging’ had its limits, and the new farmers tried to circumscribe this, arguing that as ‘foreigners’ (many had Malawian origins several generations back), their role was not as land owners but labourers. That the farmworkers had been bargaining hard on wages and opting for alternate livelihoods had played into this tension. Certainly the emerging forms of ‘belonging’ differ dramatically from that described by Blair Rutherford in the pre-land reform era, but the cultural politics of farmworker-farmer relations are as live as ever, often flaring up into disputes of this sort. Leila’s paper highlighted the value of really in-depth analysis of cases to uncover the textured dynamics of change on the farms. We have been subjected to far too much simplistic analysis, often based on spurious statistics, on farmworkers, but this sort of work really provides a much-needed qualitative insight that is immensely revealing. As the new social, political and economic relations are negotiated on the new farms, new bargains and accommodations will be struck, and this will require innovations in institutional and cultural practices; sometimes drawing on traditional norms, but in other cases requiring new deals to be struck. Taking a very different approach, Gareth James offered an overview of some of his impressive survey work across three districts in Mashonaland/Manicaland, involving a sample of over 600 (here’s the powerpoint). This involved a large sample extending the classic work by Bill Kinsey and colleagues that tracked the fortunes of ‘old resettlement’ area farmers, comparing these to their neighbours in the communal areas (see our Masvingo work on this, in a recent blog series). Gareth has developed a sample in A1 farming areas, and looked at a range of factors. This presentation focused on ‘outcomes’ and in a series of graphs he showed how the A1 farmers on average outperformed both the old resettlement area and communal area farmers across a range of criteria. As younger, more educated, more capitalised farmers, they had higher outputs and yields of major crops (maize, cotton, tobacco), applied more inputs and achieved higher incomes. He offered a listing of the constraints faced too, which included a familiar array focused on the challenges of accessing farming inputs and labour. For those of us who primarily work in the drier south of the country, the production statistics were impressive. Across the two seasons studied (both of which were not good seasons), the A1 farmers achieved an average output of around 6 tonnes of maize. Taking the standard figure of annual consumption requirements of 1 tonne per family, this means around 5 tonnes could be sold, and contribute to a dynamic of investment and accumulation that Gareth described. This was of course added to by the often impressive outputs of tobacco. Averages of course only tell one part of the story, and as he pointed out there is much variation. As we have seen in Masvingo, these dynamics create new patterns of differentiation and associated class formation in the new resettlements, with major consequences for agrarian social relations and longer term change. There was insufficient time in the presentation to explore these issues, but the results are tantalising, and the overall output statistics impressive. Of course there are qualifications, and some of these were discussed. Is this a temporary boom, based on the ‘mining’ of the soil? Will the success attract more and more people to area, and so undermine per capita success as land and outputs are shared among more and more? Did the new settlers manage to outcompete their neighbours through preferential access to inputs, offered through political patronage? All of these factors are important, but do not undermine the overall story of a production boom, with major opportunities for accumulation in the new resettlements. The final paper by Grasian Mkodzongi reflected on his work in Mhondoro Ngezi in Mashonaland West Province. Here A1 and A2 resettlement areas are in close proximity to the major Zimplats mining complex. Grasian’s paper concentrated on the relationships between farming and mining, as mediated through labour contracts, business opportunities and political connections. In addition to the large-scale mine there are many other smaller mining operations, for gold and other minerals that provide opportunities for others. The paper focused on the social and political negotiation of the farming-mining relationship, based on a number of cases. New farmers are able to insert themselves into the economic activity associated with Zimplats, supplying inputs (such as silica found on their farms) as well as profiting from upstream aspects of the value chain. Farmers have used the politically-charged debate around ‘indigenisation’ to their advantage, manipulating the rhetoric and demanding economic benefits. This sets up new political and economic relationships between the farms and the mine that are played out through local political dramas. The story is immensely complex and fast evolving, but it offers an insight into how, at the local level, new economic relations with capital are being negotiated, and how a very particular political dynamics and discourses influence this. Contrary to analyses that offer only a simplistic and generalised view of politics concluding that all is guided by top-down patronage, looking at local relations through in-depth research reveals a room for manoeuvre for those who have the resources and ingenuity to play the system. These brief and rather partial summaries cannot do justice to the richness of the papers. If you want to hear more, there is a recording of the presentations and the discussions here. As noted, each in different ways contribute to our evolving understandings of livelihoods after land reform, and demonstrate the importance of diverse methodological approaches in capturing the nuance and diversity. These three papers, all emerging from PhD studies at the University of Edinburgh, are examples of a growing array of research on different themes in different places. They add together to an impressive dataset that has yet to be fully grasped by policymakers, donors and other commentators, including many academic ‘authorities’ on Zimbabwe. A couple of years ago, I compiled a list of research projects on ‘fast-track’ land reform of different sorts, many deriving from PhD and MA degrees, and mapped them. The coverage then was impressive, and I am sure has extended much further since. Yet, despite this growing body of work, we hear again and again misleading commentary and inappropriate conclusions being drawn on land reform in Zimbabwe. But building on the earlier work, including ours in Masvingo, we now have an impressive set of insights, offering nuance and perspective on our overall assessment of Zimbabwe’s land reform. I hope this blog will continue to be a space for sharing these results with a wider audience. So if you are doing a study, and have some results to share, even if preliminary, do let me know! Zimbabwe’s gold rush: livelihoods for the poor or a patronage economy, or both? One of the features of the post 2000 economy in Zimbabwe has been the growth in small-scale artisanal gold mining. This is sometimes registered with the ministry, but very often not, and remains informal and illegal. The small-scale panners, makorokoza, can be found in very large numbers in the dry season along the main rivers of Zimbabwe. They are mostly men under 35, and so represent a particular, often disenfranchised, demographic. Many were too young to benefit from the land reform in 2000, and although some are resident on the new resettlements, combining farming with off-season panning has become an important livelihood mix. 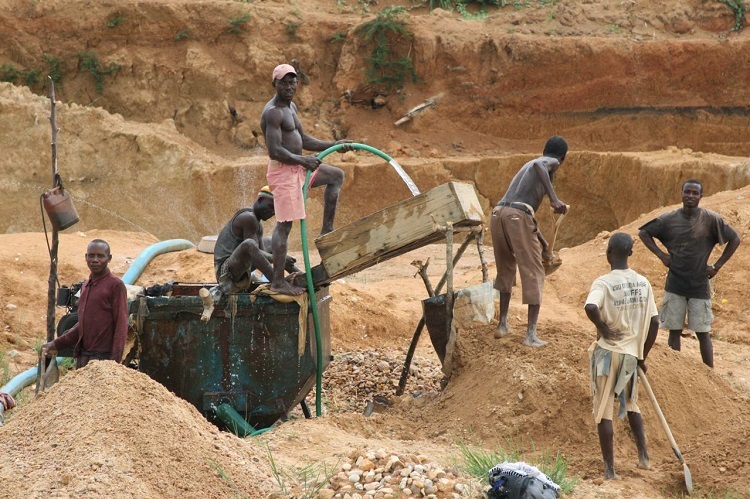 While much international attention has been focused on diamond mining, and the human rights abuses that have taken place in the Marange fields in the east of the country (see papers by Nyamunda and and Mukwambo and Bond and Sharife), there has been less commentary on gold mining. While the diamond fields have been taken over by a strong-arm alliance of government, the military and foreign investors, removing all small-scale diamond miners, the mining of gold is different. Another recent paper by Showers Mawowa explores the gold rush phenomenon based on research near KweKwe. He argues that the gold rush in his area should not be seen just as a form of local ‘survivalist’ strategies of the poor, but as a site of political control and accumulation by elites, part of a ‘patronage economy’. In Mawowa’s study area in KweKwe, former farm and mine workers rather than resettlement farmers were the new miners. Many gold panners collect tiny quantities, but are reliant on mills owned by registered small-scale mines for processing. There is a mix of alluvial panning in the open near rivers or the exploitation of disused shafts where mining takes place underground. Both types of operation may involve hundreds of individuals often working in highly dangerous conditions. The environmental damage of such intense gold rushes can be immense. This new form of production creates new social and political relationships. Mawowa characterises this as a process of primitive accumulation by elites who control the processing and marketing operations. They are also able to subvert the regulations, and are often involved in shady, illegal activities. While there are a plethora of laws governing mining, with recent stringent regulations from the Environmental Management Authority for example, they are implemented only sporadically, and often arbitrarily. Raids by the police may happen around election times, when local big-wigs want to assert control, while at other times operations go untouched, with accusations of kick-backs and bribes. In his fascinating account, Mawowa shows how alliances between miners are formed to control particular areas. They may form ‘syndicates’ that may be controlled by locally-powerful individuals, including chiefs or party officials. Access to gold resources may result in sometimes violent struggles between such groups, with clashes between ‘locals’ and ‘outsiders’ and between different political factions within ZANU-PF. The story Mawowa and others tell for Zimbabwe is familiar in other areas where artisanal mining has taken off in a big way, whether in Latin America (as in the work of Tony Bebbington and others) or elsewhere in Africa (as in the work of Deborah Bryceson and colleagues). Mawowa interprets this in terms of elite accumulation characterised by corruption, but as he notes new livelihoods have been created too. He does not make the contrast though with what went before. Once controlled by a few companies – in the Kwekwe case a Canadian mining company that owned Empress and Venice mines, closed in the 1980s and 90s – mining activity – and so livelihood opportunities and employment – is now spread among a far wider group. This reconfiguration of the economy attracts patronage from those in power – and this most certainly includes ZANU-PF officials – but in this case these include village headmen, councillors, bureaucrats in district offices and local politicians. These characters may be connected to others higher up for sure, but the new economy oils many wheels on the way. As Mawowa concedes there are many ‘rags to riches’ stories in the villages. Certainly in the period before the Marange diamond field clampdown this is what we found in Masvingo, as youth returned to their villages with fancy consumer goods, but also with cash to invest in farming. He also notes that many of the local beneficiaries of patronage are often ‘low ranking’ officials and people like headmasters and councillors. Even if there are shadowy figures behind them, further up the chain, it may be difficult to define such people as elites, even if their outward political affiliation is towards ZANU-PF; whether out of belief or very often out of strategic pragmatism (what Grasian Mkodzongi calls ‘performing ZANU-PF’). There are perhaps two ways then of thinking about these mining-based ‘patronage economies’. One is to condemn the rent-seeking, accumulation and elite control, and seek rational bureaucratic order and the implementation of controls, presumably allowing larger-scale formal operations to take the place of the informal sector. This would presage a return to the past, and a form or regulated and probably even more elite (probably foreign-controlled) capitalism. Alternatively, following the arguments of David Booth, Tim Kelsall and others, an argument could be made that there are developmental advantages of ‘working with the grain’, accepting that elite capture is somehow inevitable in the operation of capitalism, but that gains may well be shared through such patron-client networks, and there are actually not only survivalist but also developmental benefits of broad-based, distributed, informal economic activity. These alternatives are of course not either/or, and there are many shades of grey between. However, the focus of so much writing on the corrupt practices of the ZANU-PF connected elite, including many of the contributions to the JSAS special issue that includes Mawowa’s paper, often fails to delve further into the practical, distributional consequences of new forms of economic organisation. While I would be the first to condemn much of the practice that Mawowa documents, I think there is probably another side to the story that is also worthy of telling. Some interviews with some of the successful miners, traders and associated business people would be definitely interesting. It would be fascinating to learn for example how artisanal mining has changed their livelihoods and future prospects, and how such investment has been channelled into the local economy. This could in turn be contrasted with the experience of former mine workers in large-scale mines (perhaps even the same people), and how such enterprises had an impact on local livelihoods and economies. Rather like the contrast between the assumed successful, ordered and regulated commercial farming sector of the past and the assumed disorderly, chaotic and informal land reform farming areas, there may be some surprising, and challenging, findings. Minister of Finance Tendai Biti recently presented the 2013 budget. It was, in his words, the most difficult yet. He revised growth projections downwards to only 4.4%, because of continued depression in the global economy and uncertainty about Zimbabwe’s economic and political prospects. But there were some bright spots. The minister has presided over a remarkable period of recovery. Some basic graphs in his budget statement illustrate the point (copied below). 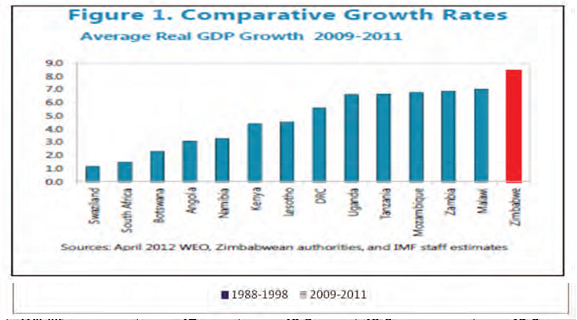 Zimbabwe has grown faster than any other country in the region, and mining and agriculture have been the greatest contributors to growth. By 2010 mining contributed a massive 18% to overall economic output as measured by formal GDP indicators, and nearly 50% of export revenue. Growth in agriculture was stronger than expected in 2012, as both tobacco and cotton performed better than projections. Maize was however heavily affected by drought. The treasury expects a continued pattern of growth in the sector, around 5-6%. 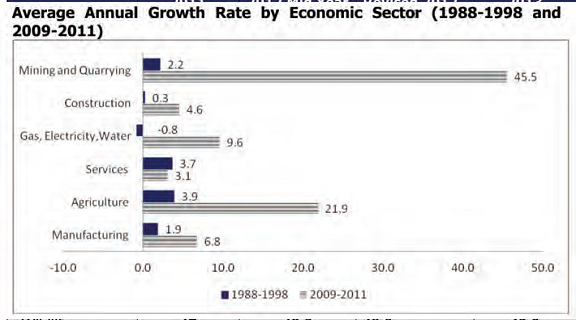 But the success of agriculture has been overshadowed by the growth of mining, with annual growth rates of around 30%. Exports increased by a massive 230% in the period from 2009-2011. By the end of 2011, mineral exports accounted for 47% of total exports, made up of platinum (43%), gold (28%), and diamonds (20%) in particular. Furthermore, the average share of mining to GDP has grown from an average of 10.2% in the 1990s to an average of 16.9% from 2009–2011 overtaking agriculture. Diamond output is expected to increase to 16.9 million carats in 2013, largely driven by enhanced production from the major diamond mining houses at Marange Diamond Fields. Platinum output is expected to rebound to 11.5 tons in 2013. However, while growth has occurred at impressive levels since dollarization in 2009, it has not continued at such rates. Zimbabwe’s seemingly miraculous recovery from the dire doldrums of the late 2000s may have stalled, a concern raised in the budget. With continued investment uncertainty, and the prospects of yet more disruption during and following elections, question marks are raised about the robustness of the economy. While minerals and agriculture can continue to underpin some growth, the levels required for recovery to earlier levels are still not being achieved. How can the economy be revived for the longer term? This will require investment, including by the state. The 2013 budget offered US$3.8bn in government expenditure. But this is a pathetically small amount in relation to needs, and much of it already accounted for in terms of salary obligations. Government taxation and revenue collection is improving, but the economic base remains small. Tendai Biti is in a bind. He is right when he says there is no more cash – not even to finance an election, let alone forge a recovery. Next week, I will look at some future scenarios, making the case for a greater focus on agriculture, and avoiding an overly strong reliance on minerals, despite their allure.